You may have spied me jetting off here and there recently. Admittedly life has been rather exciting of late. I’ve been invited to a number of wonderful trips, events and meetings, and they have all been incredible experiences. So much so that they haven’t felt like trips, more educational adventures I would like to name them! One of said trips, I’m sure you spotted on my Instagram feed. I was whisked away to magnificent New York in early October with Clarisonic, accompanied by one of my blogger besties, Em Shel. We were there to attend an exciting event for the launch of Clarisonic’s Special Edition Mia 2, an artist collaboration with Keith Haring; launching today in the UK! A highlight of the trip was being able to meet Dr Robb Akridge, the founder of the Clarisonic brand, and a truly passionate and inspirational Gent. We spent time with him in central New York, talking about the collaboration and his initial inspiration to start creating excellent cleansing devices for a skincare market that was lacking. And showing us the new packaging for the Special Edition device, we were all kinds of swooning. We jetsetted off to New York in Upper Class style, comfortable and catered to and probably the best flight experience of my life! We landed eight hours later in JFK and made our way to The Edition Hotel, for a room with an incredible view and a modern yet cosy interior. I highly recommend this hotel for anyone looking for a wonderful place to stay in the City! Luckily we had a few days to enjoy the City, so I had packed pretty heavy just so I would have time to get lots of outfits photographed. So keep your eye out for those really soon! One of the pieces I did get to wear, and the dress I chose for the special event was this striped mesh and sequin number from the 8th sign. It was a great length for feeling formal yet still really feminine and the built in black bandeau top helps to protect you under the revealing yet sophisticated mesh panelling! I’m just going to repeat the fact that it was such a pleasure to meet Dr Robb, especially for such an exciting step for Clarisonic. Before Dr Robb founded the skincare brand, he spent a lot of his life researching for a cure for HIV/AIDS, and emotionally mentioned that he had lost a number of great friends to the disease over his years. 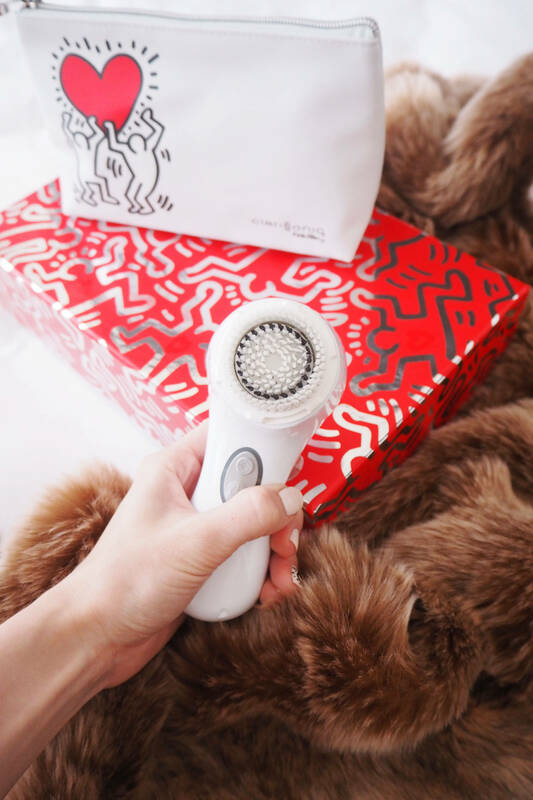 This history has fueled Clarisonic’s passion for their new partnership in sharing Keith Haring’s art and message worldwide. Keith Haring was an artist, internationally recognised in the 1980’s for his unique chalk style drawings with simple lines and shapes, who lived and thrived in New York before opening his own Pop Up Shop and being one of the only artists at that time to become recognised in the art world, and to be able to sell artwork and merchandise from an individual store. He was hugely popular and extremely successful in his short time, before he passed in 1990 due to AIDS related complications at the age of 31. The event was beautifully presented and organised and such a pleasure to attend. With a number of journalists and bloggers from around the world, Coco Rocha also made an appearance with her super long legs and wonderful energy and I could kick myself for not saying hello. But the event was high up, potentially the 21st floor of a building in the city, offering insane views around the building, looking downtown towards One World Trade Center and the busy freeways. And with such a warm evening, we spent time outside sipping cocktails and champagne and eating the tastiest brownie cookies filled with milk cream that were making their rounds around the party. There were areas in the event for a little bit of interactivity, which is always so much fun when you want to break up the evening. With three versions of the Clarisonic Mia 2 being introduced for the collaboration, Love, Dance and Pop, the room was split up as such, with an area for Love, another for Pop and the last for dance. A Photobooth was set up in front of a heart shape built out of Clarisonics with the word Love written above. The Pop area housed the popping of champagne and there were bubbles filled with sweets and candy hanging delightfully from the booth. Whilst the Dance area was for a boogy and had a chalk wall for guests to write a little message for the evening. I chased the lady with the brownies around all evening, chatted with Dr Robb and swooned over the city scape views when the sun went down until it was time for us to head off. I reviewed the original Clarisonic Mia in May 2014. Gosh it feels so long ago now! But knowing what I know about this product now, I have become so much more of a loyal fan. Dr Robb helped to explain the technology behind the device. The oscillating bristles that barely move the skin, protecting from tugging or pulling during usage. And its ability to flush out dirt in the pores as the wet bristles push the water downwards from the brush to expel, and therefore flushing the water downwards towards the pores and washing away all dirt. Plus the device is entirely waterproof and therefore great for taking straight into the shower at the end of the day to cleanse the skin of all makeup or daily dirt. And on hearing and seeing his explanations of just how fantastic it can be for the skin, I was entirely sold. More so than I already was. I am a cleansing lover and cleanse my face with a device morning and night. And the Clarisonic is one of the devices that I use majorly in my routine. I will disperse my favourite gel or oil cleanser all over my face before covering the device entirely in water. The device can then be worked gently all over the face, from cheeks to forehead, nose and chin, moving the device softly over the skin so that the bristles can almost flush and flick away the dirt from the face. The point isn’t to press down on the skin, but to let the bristles glide over the skin lightly to allow it to get to work properly on refreshing the pores. And there are now three versions to choose from, depending on where you are in the world. In the UK, the stores will be stocking the Love device, in white with a Keith Haring Illustration holding a red heart. Simple yet beautiful and I honestly prefer using my new special edition device just because of how beautiful it is. Alex has been given my original Mia 2 and has been strictly told to leave my Clarisonic x Keith Haring Device alone. And they are available to buy from today over on the Clarisonic store presented in a Keith Haring Box with a Keith Haring washbag, which has already made its way into my carry on luggage essentials kit. I’m thinking these will be a huge hit for Christmas presents or for those who adore the original Mia 2 and would like an update. Please let me know your thoughts on it! And I am so excited to add that Clarisonic are also giving you the chance to win your own! There will be TWO Clarisonic x Keith Haring Mia 2 Love Special Editions up for grabs. All you have to do is enter using the Rafflecopter form to the left and complete two simple entries. You just need to sign up to the Clarisonic Newsletter on the top left of the Clarisonic site, as a way to keep up with all the cool things they’re up to, and then follow my blog, so again you won’t miss a post! Simple. The giveaway will last for one week before we announce the winner on twitter and the winner will be emailed and sent the device from Clarisonic! The Giveaway is also only open in the UK, sorry guys! But best of luck and I’ll be announcing the two winners really soon! This post is in collaboration and sponsored by Clarisonic who also took me on this amazing trip to New York.